We often think and get confused who is the doctor to check our eye. We find one in the normal eye clinics, one in the optical and another in hospitals. I have tried giving you the difference among them, and who can be the better person to answer your queries. Each has different credentials, skills, and specialties. Opticians are technicians who have a 2-year technical degree that prepares them to work in an optometrist or ophthalmologist office or at an eyeglasses distributor. Opticians are trained to read vision-correction prescriptions from your doctor and supply you with contact lenses or fit you for eyeglasses or other eyewear, like prescription sunglasses. Opticians can also make repairs and adjustments to eyeglasses. Optometrists are doctors of optometry. In addition to an undergraduate degree, they have a degree of optometry. 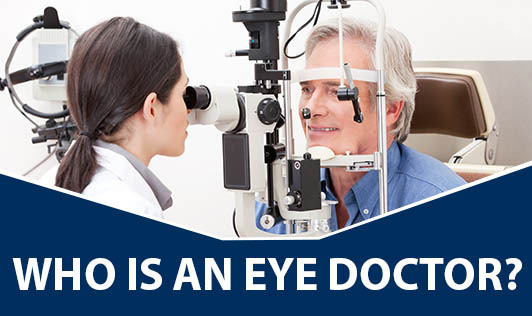 Optometrists provide comprehensive eye exams and can diagnose and treat common vision problems and certain eye abnormalities or diseases, but they are not trained to treat all diseases and disorders. Optometrists can prescribe glasses, contact lenses, eye exercises, vision aids and therapy, and medications for certain eye diseases. Ophthalmologists are doctors of the eye. They graduate from a medical college and are licensed to practice medicine, so their credentials are either doctor of medicine (MD) or doctor of osteopathy (DO). Ophthalmologists have been trained in all aspects of eye care. In addition to doing vision exams and prescribing all forms of vision correction, ophthalmologists are trained to diagnose and treat all types of eye problems, injuries, and diseases as well as perform surgery. Some ophthalmologists specialize in certain aspects of eye medicine, like neuro-ophthalmology, or in treating certain diseases, like glaucoma, cataracts, Lasik surgery, laser surgery etc. Now you know who the right person to approach is!